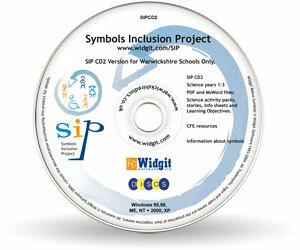 By attending one of the launches where the SIP 1 resources CD was given out in 2004/5. These were publicised by sending a flyer to all Primary Schools. By attending a presentation and /or follow up workshop about the SIP 2 CD in 2005. Again these were publicised County wide. These sessions focused on the In Print programme and resources. School Staff who attended Communication Environment Training, which was given free, were given information about the project. Specialist Staff from the Speech and Langauge Disorder Team, who visit many schools across the county, giving direct support to pupils, suggest to school staff that the SIP resources would be a useful tool. Colleagues from other teams with the support services publicise the materials in schools in the same way. The SIP team has held training sessions for staff who support pupils with Visual Impairment, Hearing Impairment, Autistic Spectrum Disorder, Physical Disability and Illness, as well as those working with pre-school children. Speech and Language Therapists who visited schools recommend the resources to SENCOs. The SIP team attend County wide information sharing sessions for school SENCOs every year. Speech and Language Disorder Team staff in the 7 Speech and Language Provoisions across the County work with school staff to raise awareness of the resources and the In Print programme.These Bases are now regarded as Centres of Excellence in terms of being Communication Friendly Environments and in using the symbol based resources to support learning. Over 170 Schools and settings are registered on the Warwickshire Schools SIP web site. This enables them to access information, support and new resources. Warwickshire has 139 primary schools, 25 Junior Schools and 31 Infant Schools - a total of 195 schools. There are also 9 Special schools, 4 Pupil Referral Units and 8 Nursery schools.All these settings were given a copy of Communicate: In Print in January 2006 when Warwickshire bought a County licence. The 36 Secondary schools are being given the programme individually. Staff from 75 schools attended a presentation about the resources. A further 66 went on to attend workshops on how to use Communicate: In Print. When Warwickshire purchased a County Licence in early 2006, a special CD was made which had all of the SIP resources as an integral part of the programme. All schools were then invited to awareness raising sessions about the programme and resources at the 7 Speech and Language Provisions. These sessions were well attended. Since then staff from the Speech and Language Disorder Team and the SIP team have given training in 80 Schools on using the programme and resources. Out of the 36 Secondary Schools 18 now have the Communicate : In Print Programme and have had some input from Staff from the Speech Language Disorder Team. CIP is usually loaded in the Learning Support Department, although some have put it on the school network. 4 have now had whole schools staff training in Communication Friendly Environments, with another 2 booked in. 6 of the 9 Special Schools use the programme and resources. Oak Wood Primary and Secondary School in Nuneaton used Widgit symbols for the sinage around the new school site. They have also had whole school staff training from the SIP team.